GoWithMIlk – Last Promo of the Year! During the month of May, we are running our GoWithMilk promotion. This promotion is the last to run during the 2016-2017 school year. Students have the chance to win one of four iPad minis. 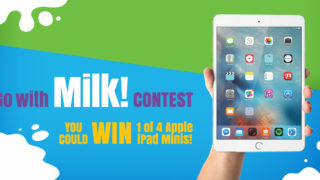 Schools have the chance to win one of four $500.00 milk credits. Good luck to all! Each time you purchase a carton of School Milk that has a Go With Milk sticker on the bottom you can return the empty carton to your canteen/cafeteria to receive your free milk coupon and an entry ballot. School Milk Foundation of Newfoundland and Labrador, 308 Brookfield Rd, Building 5A, St. Johns, NL A1E 0B2. Random draws will be made at the School Milk Foundation (SMF) office from all entries received by the May 31, 2016 deadline. The SMF is not responsible for entries received after the May 31, 2016 deadline. Contact Jessica Murphy at 709.364.2777 or jmurphy@schoolmilkfdn.nf.net with any questions or concerns. How long does it take to milk a cow? Milking a cow takes about 5 minutes and the cow feels much better after. Some farmers milk their cows two times a day and others do it three times a day. But no matter what, they have to milk cows every day of the year.